Above: Gregorio Lantajo Jr. recalls the chaos after Typhoon Yolanda, which tore through his barangay, or village, killing 377 and leveling hundreds of homes. Lantajo is a community leader from one of the hardest-hit areas. The Philippines was devastated by a super typhoon in November 2013 that affected 16 million people. UCLA student donations played a part in the relief missions of several aid agencies in the wake of the storm. The typhoon has two names, Haiyan and Yolanda. These stories use Yolanda, its Filipino name, for consistency and cultural accuracy. Reporter Katie Shepherd, photojournalist Neil Bedi and data journalist Byron Lutz spent 19 days in the Philippines talking to survivors of the typhoon, displaced residents and aid organizations about the massive rehabilitation efforts underway in the Eastern Visayas. The Bridget O’Brien Scholarship Foundation has funded seven years of UCLA student journalism with global reach and local impact, including this project. To learn more about the scholarship, visit rememberingbridget.com. 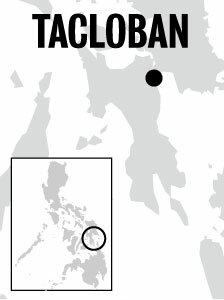 TACLOBAN, Philippines — As water inched up the elementary school walls around 5 a.m. after three hours of heavy rain, the mother made her snap decision. She grabbed her youngest son and swam toward the second-floor staircase inside the Fishermen’s Village Elementary School, toward safety and away from the floodwater seeping into the building. Behind her, two older children clung to a windowsill in the panic and chaos as people tried to escape the rising water. Algina Lacaba made her way back to the first-story window where her eldest son and daughter were waiting to be rescued and brought them back safely. Sitting in the entrance of her temporary home, Algina Lacaba remembers pulling her children out of the floodwaters during the storm. Huddled together and soaked from the floodwaters, the family began its struggle to stay alive in the aftermath of Typhoon Yolanda. UCLA students donated a total of $12,000 to three aid organizations – National Alliance for Filipino Concerns, People’s Community Organization for Reform and Empowerment and GlobalGiving – that helped provide aid following the typhoon, which hit land on Nov. 8, 2013. Typhoons are familiar events for Filipinos. But Typhoon Yolanda was different. Yolanda possessed a quality that most typhoons in the Philippines lack: strong storm surges. The storm surges were a series of monumental, tsunami-like waves that crashed in coastal regions on the island. The typhoon struck hardest on the islands of Leyte and Samar in the central Philippines. Eleven months after the storm, the steel frames of warehouses and malls stand next to homes with tarps for roofs. Typhoon Yolanda is one of the strongest typhoons on record and killed more than 6,200 people, according to the official death toll tallied by the Philippine government. Almost 2,000 people are still missing. The government sent out warnings and the news channels broadcast reports of the super typhoon barreling toward Leyte, but many residents did not expect the storm to cause the damage or death that it did. Local residents had braced for strong winds and heavy rains, but they were not expecting their homes to be swept away by rushing water more than 16 feet deep. People left their homes for evacuation centers in anticipation of the storm, but these buildings became epicenters of death as many drowned in the floodwaters. 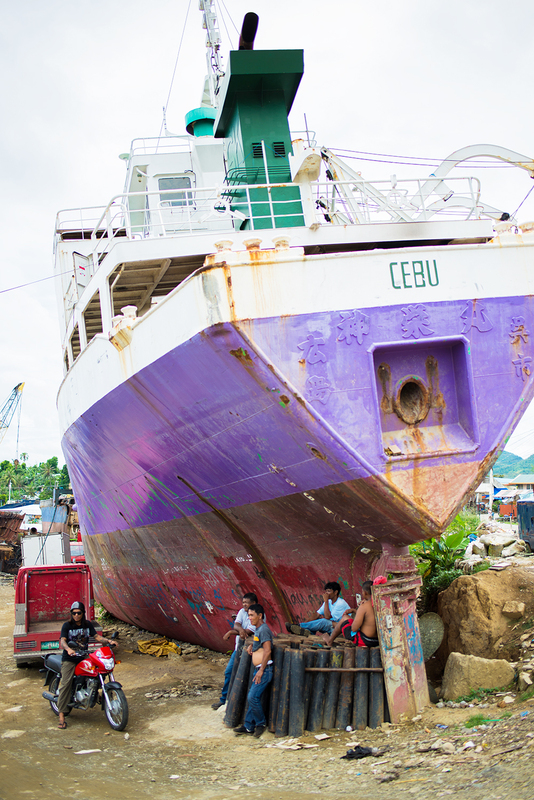 Ships in the Tacloban harbor were washed ashore, crushing homes beneath their massive hulls. The buildings that weren’t crushed by debris were flooded to the second floor or higher. Dead bodies inside the Lacabas’ first evacuation center forced the family to move to another center as soon as the water receded. Yolanda had also taken the road, making it impossible for anyone to access the San Joaquin area to provide emergency relief in the days following the typhoon. Isolation was so hard. We had to drink water that was contaminated. We had to eat rice that was old and starting to smell.” —Gregorio Lantajo Jr.
A few kilometers south of Tacloban, Gregorio Lantajo Jr. waited for the water to recede from his community so that he could assess the heavy damage to the San Joaquin barangay, or village. As the barangay’s chairman and a community leader, Lantajo had prepared for the typhoon by stashing emergency medical and food supplies for his people. But the floods washed away his preparation, he said. The first aid didn’t reach San Joaquin until five days after the typhoon, Lantajo said. 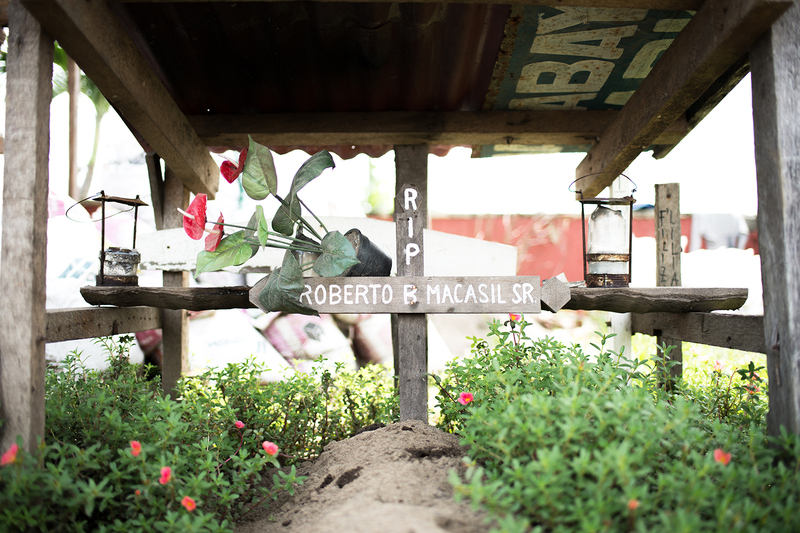 A grave of one of the San Joaquin residents killed by Typhoon Yolanda stands among hundreds of other handmade memorials. And when government aid finally arrived some time later, it consisted of just 22 pounds of rice, 55 pounds of noodles and a few cans of sardines, he added. That food was to be dispersed to a community of just under 3,000 people. Every resident in San Joaquin lost his or her home, and about 10 percent of the village’s population died during or just after the typhoon, Lantajo said. “Every day I had to pull out dead bodies and bury them in a mass grave,” Lantajo said with tears in his eyes. His father was one of the casualties of the storm, and his body wasn’t recovered until four days after it. Lantajo said he personally recovered more than 70 bodies, and the barangay buried 377 people in a mass grave in front of a church. Many problems still remain unsolved 11 months after the typhoon. More than 2 million Filipinos don’t have permanent housing almost a year later, and live in tents or temporary homes made of thin, woven bamboo sheets. Debris that was blown into residential neighborhoods hasn’t been cleared in many areas, especially near the coast. And entire crops of coconut trees that were snapped in half by the winds still litter fields, preventing farmers from planting new crops. Aid organizations, helped by funds sent by UCLA students, provided food, clean water, shelter, lighting, clothes and other resources necessary for survival in the weeks after the storm. Some families still live in tents provided by the U.N. refugee agency, which were intended as emergency housing. The fading tents were only meant to last six months, and the now-flimsy structures are hot in the morning, cold at night and flood in the rain. Others have moved into temporary housing made of woven bamboo sheets. The Lacaba family lives in one of these homes now. The one-room shack is part of a community of similar housing units that keeps typhoon victims dry and allows them to work on obtaining a permanent home. The government is asking, ‘What is your preparation? Why so many casualties? I turn the question around on them. Why does it take more than five days (to get aid) and not from the government, from the NGOs?” —Gregorio Lantajo Jr. The government and other organizations provide the land and resources to construct the houses, and the future residents supply the manpower. Families must invest 500 hours of labor working on their permanent housing development, a practice known as “sweat equity,” before they are permitted to move in. These homes will have bathrooms, and will be made from concrete and wired for electricity. While many of the permanent housing units now being built in Leyte are sponsored by the local and national governments of the Philippines, some people still lament their slow response in the days immediately after the storm. Near the coastline of Tacloban, 10 ships washed ashore in the tumult of Typhoon Yolanda. Nearly a year later, this ship has yet to be removed. Lantajo said his community is being denied insurance claims from the government for their deceased because they already received aid from independent aid organizations. Under Philippine law, families of the missing can’t make claims for their dead until eight years pass. Even with the efforts of many local and international charities, the island of Leyte is still undergoing massive recovery efforts. Roads are being reconstructed. Permanent homes are being built for those who lost their houses to the storm. Stories by Katie Shepherd, photos by Neil Bedi, and site/graphics by Byron Lutz. All content © 2014. Learn more about the Bridget O'Brien Scholarship Foundation.